COPD is characterized "by airflow limitation that is not fully reversible.The airflow limitation is usually progressive and associated with an abnormal inflammatory response of the lung to noxious particles or gases." The lungs provide a very large surface area (the size of a football field) for the exchange of oxygen and carbon dioxide between the body and the environment. A slice of normal lung looks like a pink sponge filled with tiny bubbles or holes. These bubbles, surrounded by a fine network of tiny blood vessels, give the lungs a large surface to exchange oxygen (into the blood where it is carried throughout the body) and carbon dioxide (out of the blood). This process is called gas exchange. Healthy lungs do this very well. You breathe in air through your nose and mouth. The air travels down through your windpipe (trachea) then through large and small tubes in your lungs called bronchial tubes. The larger tubes are bronchi, and the smaller tubes are bronchioles. Sometimes the word "airways" is used to refer to the various tubes or passages that air must travel through from the nose and mouth into the lungs. The airways in your lungs look something like an upside-down tree with many branches. At the ends of the small bronchial tubes, there are groups of tiny air sacs called alveoli. The air sacs have very thin walls, and small blood vessels called capillaries run in the walls. Oxygen passes from the air sacs into the blood in these small blood vessels. At the same time, carbon dioxide passes from the blood into the air sacs. Carbon dioxide, a normal byproduct of the body's metabolism, must be removed. The airways and air sacs in the lung are normally elastic—that is, they try to spring back to their original shape after being stretched or filled with air, just the way a new rubber band or balloon would. This elastic quality helps retain the normal structure of the lung and helps to move the air quickly in and out. In COPD, much of the elastic quality is gone, and the airways and air sacs no longer bounce back to their original shape. This means that the airways collapse, like a floppy hose, and the air sacs tend to stay inflated. The floppy airways obstruct the airflow out of the lungs, leading to an abnormal increase in the lungs' size. In addition, the airways may become inflamed and thickened, and mucus-producing cells produce more mucus, further contributing to the difficulty of getting air out of the lungs. In the emphysema type of COPD, the walls between many of the air sacs are destroyed, leading to a few large air sacs instead of many tiny ones. Consequently, the lung looks like a sponge with many large bubbles or holes in it, instead of a sponge with very tiny holes. 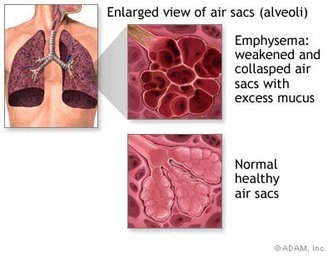 The large air sacs have less surface area for the exchange of oxygen and carbon dioxide than healthy air sacs. Poor exchange of the oxygen and carbon dioxide causes shortness of breath. Most cases of chronic obstructive pulmonary disease (COPD) develop after repeatedly breathing in fumes and other things that irritate and damage the lungs and airways. Cigarette smoking is the most common irritant that causes COPD. Pipe, cigar, and other types of tobacco smoke can also cause COPD, especially if the smoke is inhaled. Breathing in other fumes and dusts over a long period of time may also cause COPD. The lungs and airways are highly sensitive to these irritants. They cause the airways to become inflamed and narrowed, and they destroy the elastic fibers that allow the lung to stretch and then return to its resting shape. This makes breathing air in and out of the lungs more difficult. Being around secondhand smoke (smoke in the air from other people smoking cigarettes) also plays a role in an individual developing COPD. Genes—tiny bits of information in your body cells passed on by your parents—may play a role in developing COPD. In rare cases, COPD is caused by a gene-related disorder called alpha 1 antitrypsin deficiency. Alpha 1 antitrypsin is a protein in the blood that inactivates destructive proteins. People with antitrypsin deficiency have low levels of alpha 1 antitrypsin; the imbalance of proteins leads to the destruction of the lungs and COPD. If people with this condition smoke, the disease progresses more rapidly. A person who has had frequent and severe lung infections, especially during childhood, may have a greater chance of developing lung damage that can lead to COPD. Fortunately, this is much less common today with antibiotic treatments. Most people with COPD are at least 40 years old or around middle age when symptoms start. It is unusual, but possible, for people younger than 40 years of age to have COPD. A cough that doesn't go away and coughing up lots of mucus are common signs of COPD. These often occur years before the flow of air in and out of the lungs is reduced. However, not everyone with a cough and sputum production goes on to develop COPD, and not everyone with COPD has a cough. The severity of the symptoms depends on how much of the lung has been destroyed. If you continue to smoke, the lung destruction is faster than if you stop smoking. Doctors consider a diagnosis of chronic obstructive pulmonary disease (COPD) if you have the typical symptoms and a history of exposure to lung irritants, especially cigarette smoking. 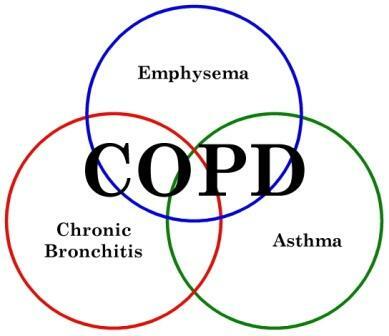 A medical history, physical exam, and breathing tests are the most important tests to determine if you have COPD. Your doctor will examine you and listen to your lungs. Your doctor will also ask you questions about your family and medical history and what lung irritants you may have been around for long periods of time. Your doctor will use a breathing test called spirometryto confirm a diagnosis of COPD. This test is easy and painless and shows how well your lungs work. You breathe hard into a large hose connected to a machine called a spirometer. When you breathe out, the spirometer measures how much air your lungs can hold and how fast you can blow air out of your lungs after taking a deep breath. At risk (for developing COPD). Breathing test is normal. Mild signs that include a chronic cough and sputum production. Mild COPD. Breathing test shows mild airflow limitation. Signs may include a chronic cough and sputum production. At this stage, you may not be aware that airflow in your lungs is reduced. Moderate COPD. Breathing test shows a worsening airflow limitation. Usually the signs have increased. Shortness of breath usually develops when working hard, walking fast, or doing other brisk activities. At this stage, a person usually seeks medical attention. Severe COPD. Breathing test shows severe airflow limitation. A person is short of breath after just a little activity. In very severe COPD, complications like respiratory failure or signs of heart failure may develop. At this stage, the quality of life is greatly impaired and the worsening symptoms may be life threatening. Bronchodilator reversibility testing. This test uses the spirometer and medicines called bronchodilators. Bronchodilators work by relaxing tightened muscles around the airways and opening up airways quickly to ease breathing. Your doctor will use the results of this test to see if your lung problems are being caused by another lung condition such as asthma. However, since airways in COPD may also be constricted, your doctor can use the results of this test to help set your treatment goals. Other pulmonary function testing. For instance, your doctor could test diffusion capacity. A chest x ray is a picture of your lungs. A chest x ray may be done to see if another disease, like heart failure, may be causing your symptoms. Arterial blood gas. This is a blood test that shows the oxygen level in your blood. It is measured in people with severe COPD to see if oxygen treatment is recommended. Quitting smoking is the single most important thing you can do to reduce your risk of developing chronic obstructive pulmonary disease (COPD) and slow the progress of the disease. Your doctor will recommend treatments that help relieve your symptoms and help you breathe easier. However, COPD cannot be cured. The treatment for COPD is different for each person. We may recommend that you see a lung specialist called a pulmonologist. Treatment is based on whether your symptoms are mild, moderate, or severe. Medicines and pulmonary rehabilitation (rehab) are often used to help relieve your symptoms and to help you breathe more easily and stay active. Physicians may recommend medicines called bronchodilators that work by relaxing the muscles around your airways. This type of medicine helps to open your airways quickly and make breathing easier. Bronchodilators can be either short acting or long acting. Short-acting bronchodilators (albuterol/Ventolin HFA or levabuterol tartrate/Xopenex HFA) last about 4 to 6 hours and are used only when needed especially for rescue therapy. Long-acting bronchodilators (salmeterol/Serevent or formoterol/Foradil) last about 12 hours or more and may be prescribed for daily maintenance usage. Most bronchodilator medicines are inhaled, so they go directly into your lungs where they are needed. There are many kinds of inhalers, and it is important to know how to use your inhaler correctly. If you have mild COPD, your doctor may recommend that you use a short-acting bronchodilator. You then will use the inhaler only when needed. If you have moderate or severe COPD, your doctor may recommend regular treatment with one or more inhaled bronchodilators. You may be told to use one long-acting bronchodilator. Some people may need to use a long-acting bronchodilator and a short-acting bronchodilator. This is called combination therapy. Inhaled steroids are used for some people with moderate or severe COPD. Inhaled steroids work to reduce airway inflammation. We may recommend that you try inhaled steroids for a trial period of 6 weeks to 3 months to see if the medicine is helping with your breathing problems. This is indicated for the long-term, once-daily, maintenance treatment of bronchospasm associated with chronic obstructive pulmonary disease (COPD), including chronic bronchitis and emphysema. Spiriva is not indicated for the initial treatment of acute episodes of bronchospasm, i.e., rescue therapy and is contraindicated in patients with a history of hypersensitivity to atropine or its derivatives. The flu (influenza) can cause serious problems in people with COPD. Flu shots can reduce the chance of getting the flu. You should get a flu shot every year. This vaccine should be administered to those with COPD to prevent a common cause of pneumonia. Revaccination may be necessary after 5 years in those older than 65 years of age. Pulmonary rehabilitation (rehab) is a coordinated program of exercise, disease management training, and counseling that can help you stay more active and carry out your day-to-day activities. What is included in your pulmonary rehab program will depend on what you and your doctor think you need. It may include exercise training, nutrition advice, education about your disease and how to manage it, and counseling. The different parts of the rehab program are managed by different types of health care professionals (doctors, nurses, physical therapists, respiratory therapists, exercise specialists, dietitians) who work together to develop a program just for you. Pulmonary rehab programs can include some or all of the following aspects. To decide what you need in your pulmonary rehab program, a medical evaluation will be done. This may include getting information on your health history and what medicines you take, doing a physical exam, and learning about your symptoms. A spirometry measurement may also be done before and after you take a bronchodilator medicine. You will work with your pulmonary rehab team to set goals for your program. These goals will look at the types of activities that you want to do. For example, you may want to take walks every day, do chores around the house, and visit with friends. These things will be worked on in your pulmonary rehab program. Your program may include exercise training. This training includes showing you exercises to help your arms and legs get stronger. You may also learn breathing exercises that strengthen the muscles needed for breathing. Many pulmonary rehab programs have an educational component that helps you learn about your disease and symptoms, commonly used treatments, different techniques used to manage symptoms, and what you should expect from the program. The education may include meeting with (1) a dietitian to learn about your diet and healthy eating; (2) an occupational therapist to learn ways that are easier on your breathing to carry out your everyday activities; or (3) a respiratory therapist to learn about breathing techniques and how to do respiratory treatments. You will talk with your pulmonary rehab team at different times during your program to go over the goals that you set and see if you are meeting them. For example, if your goal is to walk every day for 30 minutes, you will talk to members of your pulmonary team and tell them how often you are walking and for how long. The team is interested in helping you reach your goals. Bullectomy. In this procedure, doctors remove one or more very large bullae from the lungs of people who have emphysema. Bullae are air spaces that are formed when the walls of the air sacs break. The air spaces can become so large that they interfere with breathing. Lung volume reduction surgery (LVRS). In this procedure, surgeons remove sections of damaged tissue from the lungs of patients with emphysema. A major NHLBI study of LVRS recently showed that patients whose emphysema was mostly in the upper lobes of the lung and who had this surgery, along with medical treatment and pulmonary rehabilitation, were more likely to function better after 2 years than patients who received medical therapy only. They also did not have a greater chance of dying than the other patients. A small group of these patients who also had low exercise capacity after pulmonary rehabilitation but before surgery were also more likely to function better after LVRS than similar patients who received medical treatment only. A lung transplant may be done for some people with very severe COPD. A transplant involves removing the lung of a person with COPD and replacing it with a healthy lung from a donor. We will look at things that might be causing these signs and symptoms to suddenly worsen. Sometimes the signs and symptoms are caused by a lung infection. We may want you to take an antibiotic medicine that helps fight off the infection. We may also recommend additional medicines to help with your breathing. These medicines include bronchodilators and glucocorticosteroids. Although there is no cure for chronic obstructive pulmonary disease (COPD), your symptoms can be managed, and damage to your lungs can be slowed. If you smoke, quitting is the most important thing you can do to help your lungs. Information is available on ways to help you quit smoking. You also need to try to stay away from people who are smoking or places where there is smoking. Keep smoke, fumes, and strong smells out of your home. If your home is painted or sprayed for insects, have it done when you can stay away from your home. Cook near an open door or window. If you heat with wood or kerosene, keep a door or window open. Keep your windows closed and stay at home when there is a lot of pollution or dust outside. If you are taking medicines, take them as ordered and make sure you refill them so you do not run out. See your doctor at least two times a year, even if you are feeling fine. Make sure you bring a list of medicines you are taking to your doctor visit. Ask your us about getting a flu shot and pneumonia vaccination. Eat healthy foods. Ask your family to help you buy and fix healthy foods. Eat lots of fruits and vegetables. Eat protein food like meat, fish, eggs, milk, and soy. Asking your friends and family for help. Putting things you need in one place that is easy to reach. Finding very simple ways to cook, clean, and do other chores. Some people use a small table or cart with wheels to move things around. Using a pole or tongs with long handles can help you reach things. Wearing clothes and shoes that are easy to put on and take off. Asking for help moving your things around in your house so that you will not need to climb stairs as often. Picking a place to sit that you can enjoy and visit with others. You find that is hard to talk or walk. Your heart is beating very fast or irregularly. Your breathing is fast and hard, even when you are using your medicines. Smoking is the most common cause of chronic obstructive pulmonary disease (COPD). COPD is a disease that slowly worsens over time, especially if you continue to smoke. Breathing in other kinds of lung irritants, like pollution, dust, or chemicals, over a long period of time may also cause or contribute to COPD. Secondhand smoke and genetic disorders can also play a role in COPD. There is no cure for COPD (which includes emphysema and chronic bronchitis), and it is a major cause of illness and death. In COPD, much of the elastic quality of the airways and air sacs in the lung is gone. The airways collapse and obstruct the normal airflow. Airways may also become inflamed and thickened. The signs and symptoms of COPD are different for each person. Common signs are cough, sputum production, shortness of breath, wheezing, and chest tightness. COPD usually occurs in people who are at least 40 years old. COPD is not contagious. If you have COPD, you are more likely to have lung infections, which can be fatal. Your doctor can use a medical history, physical exam, and breathing tests, such as spirometry, to diagnose—or rule out—COPD even before you have significant symptoms. If the lungs are severely damaged, the heart may be affected. A person with COPD dies when the lungs and heart are unable to function and get oxygen to the body's organs and tissues, or when a complication such as a severe infection occurs. Treatment for COPD may help prevent complications, prolong life, and improve a person's quality of life. Quitting smoking, staying away from people who are smoking, and avoiding exposure to other lung irritants are the most important ways to reduce your risk of developing COPD or to slow the progress of the disease. Treatment may include medicines such as bronchodilators, steroids, flu shots, and pneumococcal vaccine to avoid or reduce further complications. As the symptoms of COPD get worse over time, a person may have more difficulty with walking and exercising. You should talk to your doctor about exercising and whether you would benefit from a pulmonary rehab program—a coordinated program of exercise, physical therapy, disease management training, advice on diet, and counseling. Oxygen treatment and surgery to remove part of a lung or even to transplant a lung may be recommended for persons with severe COPD. If you have a sudden worsening of signs or symptoms, it is important to contact your doctor and seek emergency treatment. Be prepared and have information on hand that you or others would need in a medical emergency, such as information on medicines you are taking, directions to the hospital or your doctor’s office, and people to contact if you are unable to speak or call them. Questions for Your Doctor : What to Ask About C.O.P.D. Confronting a new diagnosis can be frightening -- and because research changes so often, confusing. Here are some questions you may not think to ask your doctor, along with notes on why they’re important. I’ve never smoked cigarettes (or quit 20 years ago). How could I get C.O.P.D.? Smoking is far and away the leading cause of C.O.P.D. in the United States and accounts for 85 percent of cases (though only about 20 percent of all smokers develop C.O.P.D. with significant symptoms); the disease can develop in people who quit years ago. Passive exposure to secondhand smoke may also play a role. In developing countries, exposure to indoor smoke from heating or cooking can cause the disease. Job exposures (such as to silica in mines) may also cause C.O.P.D. Air pollution likely accounts for only 1 percent to 2 percent of cases, although it can make the disease worse. I’ve smoked for 25 years. Will quitting now make a difference? Quitting smoking is the most effective thing you can do to treat C.O.P.D. Smoking inflames the lungs and airways, and while stopping may not be enough to prevent disease progression completely, it may slow it. Studies show that, overall, quitting smoking brings about a 50 percent sustained reduction in lung function decline. In one study from 2001, nicotine replacements products, such as gums, sprays or a patch, were more effective than the pill buproprion (Zyban) in helping smokers with C.O.P.D. to quit. A newer smoking cessation drug, called Chantix, is also available. Counseling may also help. Do I need a breathing test (spirometry)? Spirometry, a relatively simple breathing test that measures how much and how quickly air moves out of the lungs, is the best way to assess lung function in patients with C.O.P.D. It is critical for making a diagnosis and assessing progression of the disease. Unfortunately, harried physicians too often skip the test, which only takes a few minutes. A recent study of 25 primary care practices found that most did not perform the test, even when they had the equipment to do so. Should I see a lung specialist? A lung specialist would be most likely to perform spirometry during routine visits and be familiar with medications to treat C.O.P.D. That includes preventive medicines to open the airways and quell inflammation, which should be taken daily and not just in emergencies. It’s also critical that patients know how to use inhalers and other medications properly. If you have C.O.P.D., doctors generally recommend you get spirometry at least once a year. More frequent visits may be needed to assess your response to therapy. It’s also important to see your doctor if symptoms worsen -- an increase in cough, sputum or shortness of breath beyond normal day-to-day variations. What will happen if I catch a cold or the flu? Will it make my C.O.P.D. worse? Respiratory ailments like colds, the flu or acute bronchitis can cause a flare-up of C.O.P.D., and patients may not return to their previous levels of lung function after the illness. That’s why doctors advise patients with C.O.P.D. to stay up-to-date on vaccinations, including an annual flu shot and a pneumonia vaccination every five or six years. It’s also important that respiratory ailments be diagnosed and treated early with antibiotics or other measures. Can weather affect my symptoms? Many patients’ symptoms worsen with weather changes, such as fronts coming through, more humidity or impending rain or snow. Doctors used to suggest that patients with C.O.P.D. live in a dry climate but now recognize that dry weather isn’t necessarily better for all patients. Aim to maintain a healthy weight. Some people with advanced disease lose so much weight their muscles begin to waste. Obesity, on the other hand, can worsen symptoms like shortness of breath. What limitations will there be on my activity? Limitations depend on how advanced C.O.P.D. is when it’s diagnosed. Unfortunately, C.O.P.D. is often diagnosed late, because people are unaware that symptoms such as a smoker’s cough or shortness of breath are problematic. Often the symptoms progress so slowly that people don’t recognize that they require treatment. If C.O.P.D. is caught relatively early, patients have fewer limitations on their activity. Should I be engaging in special exercises? Exercise is now one of the most important components of C.O.P.D. treatment. Unfortunately, shortness of breath drives many patients to become inactive. Your doctor or a pulmonary therapist can teach you activities to strengthen the arms or legs, as well as breathing exercises to strengthen the muscles used for breathing. Pulmonary rehabilitation, which involves an exercise program, along with counseling and education, can ease shortness of breath and improve quality of life in patients with C.O.P.D. It’s not available in all parts of the country, however, and insurance coverage varies. How likely is my disease to become worse? Some people with C.O.P.D. progress rapidly; doctors aren’t sure why. Early treatment is important because it may slow the worsening of symptoms. Is surgery an option for my C.O.P.D.? Some patients with very advanced disease may be candidates for lung volume reduction surgery, which removes areas of lung badly damaged by emphysema. The operation helps some, but not all, patients breathe easier. The surgery is undergoing testing at various medical centers to determine who might benefit most. Some newer, minimally invasive forms of lung surgery for C.O.P.D. are also being examined in clinical trials.